Throughout my travels I have built up a small list of essentials that are always at the top of my list to pack and today I wanted to share them with you. I'll be bringing all these essentials with me as I'm leaving for Miami on Friday for a 5 day vacation. I am so ready to be out of this cold and into the warm sunshine! 1. This bag is the perfect way to keep track of your already worn undergarments. I pack my unmentionables in this bag before my trip and unpack it when I arrive at my destination. Throughout my trip, I reload the bag with what needs to be washed so I always know what has been worn. 3. Since my vacations tend to always be to a warmer climate, a scarf is necessary for me when I go away. It's perfect for breezy nights when the sun goes down and doubles as an extra layer of warmth on the chilly plane. 4. 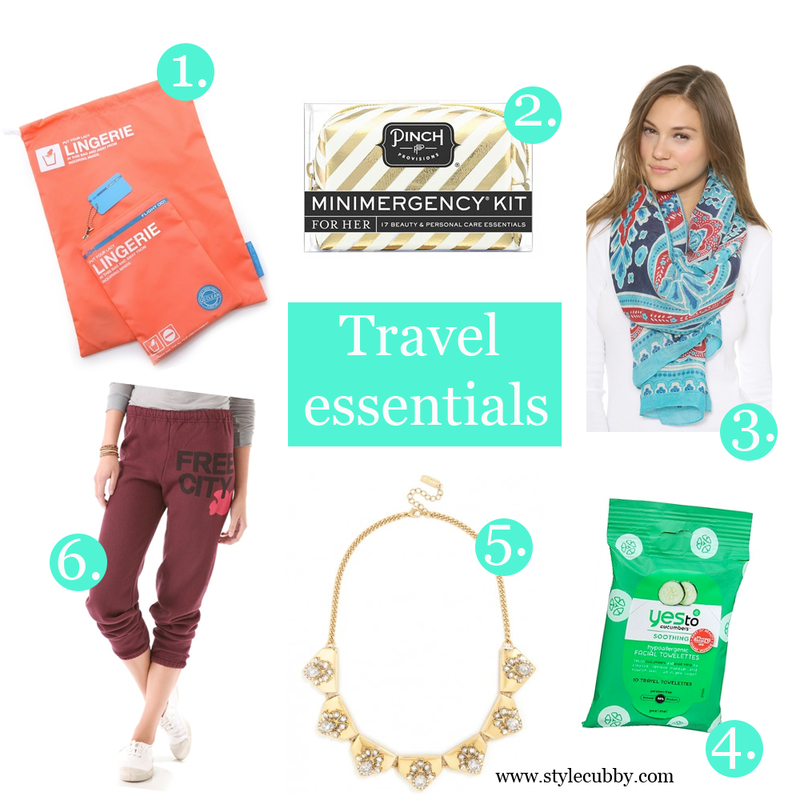 Face wipes are the perfect pick-me-up to have while traveling. After a plane ride I like to wipe my face down, it wakes me up and makes me feel clean and refreshed. I also love to use these when I get back from the pool or beach to wipe the sand and salt away. 5. When packing it's always nice to have versatile items, this necklace is neutral and could be paired with almost any outfit. 6. Sometimes there is nothing better after a day in the sun than cranking the air conditioning in hotel room, putting on some sweatpants, and crawling into bed to watch a movie. you share very well information about bags and other materiel..i mostly purchase bags from shanghai when i go with china bus..i will share your information with my friends.